This Geo: Geography and Environment blog post is cross-posted with permission from the authors, Renée Sieber (McGill University, Canada) and Muki Haklay (University College London, UK). Our recent paper, The epistemology(s) of volunteered geographic information: a critique, started from a discussion we had about changes within the geographic information science (GIScience) research communities over the past two decades. We’ve both been working in the area of participatory geographic information systems (GIS) and critical studies of geographic information science (GIScience) since the late 1990s, where we engaged with people from all walks of life with the information that is available in GIS. 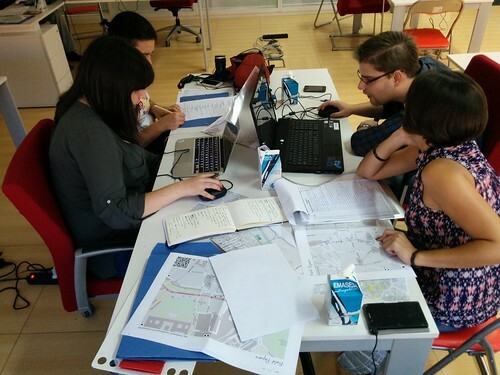 Many times we’d work together with people to create new geographic information and maps. Our goal was to help reflect their point of view of the world and their knowledge about local conditions, not always aim for universal rules and principles. For example, the image below is from a discussion with the community in Hackney Wick, London, where individuals collaborated to ensure the information to be captured represented their views on the area and its future, in light of the Olympic works that happened on their doorstep. The GIScience research community, by contrast, emphasizes quantitative modelling and universal rules about geographic information (exemplified by frequent mentioning of Tobler’s first law of Geography). The GIScience research community was not especially welcoming of qualitative, participatory mapping efforts, leaving these efforts mostly in the margins of the discipline. Around 2005, researchers in GIScience started to notice that when people used their Global Positioning System (GPS) devices to record where they took pictures or used online mapping apps to make their own maps, they were generating a new kind of geographic information. Once projects like OpenStreetMap and other user-generated geographic information came to the scene, the early hostility evaporated and volunteered geographic information (VGI) or crowdsourced geographic information was embraced as a valid, valuable and useful source of information for GIScience research. More importantly, VGI became an acceptable research subject, with subjects like how to assess quality and what motivates people to contribute. This about-face was puzzling and we felt that it justified an investigation of the concepts and ideas that allowed that to happen. Why did VGI become part of the “truth” in GIScience? In philosophical language, the questions ‘where does knowledge come from? how was it created? What is the meaning and truth of knowledge?’ is known as epistemology and our paper evolved into an exploration of the epistemology, or more accurately the multiple epistemologies, which are inherent in VGI. It’s easy to make the case that VGI is a new way of knowing the world, with (1) its potential to disrupt existing practices (e.g. the way OpenStreetMap provide alternative to official maps as shown in the image below) and (2) the way VGI both constrains contributions (e.g., 140 chars) and opens contributions (e.g., with its ease of user interface; with its multimedia offerings). VGI affords a new epistemology, a new way of knowing geography, of knowing place. Rather than observing a way of knowing, we were interested in what researchers thought was the epistemology of VGI. They were building it in real-time and attempting to ensure it conformed to existing ways of knowing. An analog would be: instead of knowing a religion from the inside, you construct your conception of it, with your own assumptions and biases, while you are on the outside. We argue that construction was occurring with VGI. We likewise were interested in the way that long-standing critics of mapping technologies would respond to new sources of data and new platforms for that data. Criticism tends to be grounded in the structuralist works of Michel Foucault on power and how it is influenced by wider societal structures. Critics extended traditional notions of volunteerism and empowerment to VGI, without necessarily examining whether or not these were applicable to the new ‘ecosystem’ of geospatial apps companies, code and data. We also were curious why the critiques focussed on the software platforms used to generate the data (e.g., Twitter) instead of the data themselves (tweets). It was as if the platforms used to create and share VGI are embedded in various socio-political and economic configurations. However, the data were innocent of association with the assemblages. Lastly, we saw an unconscious shift in the Critical GIS/GIScience field from the collective to the personal. Historically, in the wider field of human geography, when we thought of civil society mapping together by using technology, we looked at collective activities like counter-mapping (e.g., a community fights an extension to airport runway by conducting a spatial analysis to demonstrate the adverse impacts of noise or pollution to the surrounding geography). We believe the shift occurred because Critical GIS scholars were never comfortable with community and consensus-based action in the first place. In hindsight, it probably is easier to critique the (individual) emancipatory potential as opposed to the (collective) empowerment potential of the technology. Moreover, Critical GIS researchers have shifted their attention away from geographic information systems towards the software stack of geospatial software and geosocial media, which raises question about what is considered under this term. For all of these reasons and more we decided to investigate the “world building” from both the instrumentalist scientists and from their critics. We do use some philosophical framing—Borgmann has a great idea called the device paradigm—to analyse what is happening, and we hope that the paper will contribute to the debate in the critical studies of geographical information beyond the confines of GIScience to human geography more broadly. About the authors: Renée E. Sieber is an Associate Professor in the Department of Geography and the School of Environment at McGill University. Muki Haklay is Professor of Geographical Information Science in the Department of Civil, Environmental and Geomatic Engineering at University College London. This entry was posted in Refereed Publications & Conferences and tagged crosspost, crowdsourcing, Geo: Geography and Environment journal, Muki Haklay, open access, Renee Sieber, VGI, volunteered geographical information on October 15, 2015 by Geothink.